Unknown architectural style. 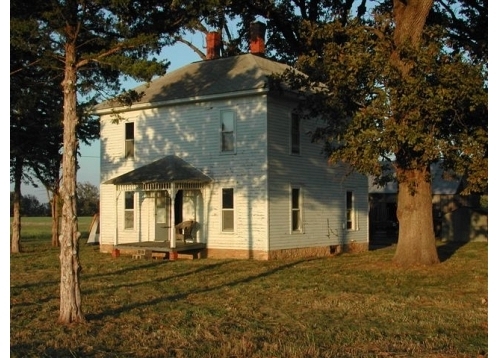 Kansas farmhouse believed to have been built in the late 1800's. Seems to be a Four-Square design, but more simplistic and no dormer or porch. Two chimneys indicate hidden flues. All original woodwork, windws, and floors still exist. Cabinets and a sink were added sometime during the 1950's and a bathroom was added downstairs off the kitchen in the 1970's. Metal grates in floors upstairs allow heat from stove to rise to upper bedrooms. Sits on limestone foundation. Attic has a ladder that leads to an opening similar to a small trap door in order to look out over the prairie.